A PADI instructor conducts a brief orientation followed by your first underwater experience where you will be allowed time to become comfortable with the equipment and breathing underwater. A PADI instructor conducts a brief orientation followed by your first underwater experience, where you will be allowed time to become comfortable with the equipment and breathing underwater. You will have the chance to experience the feeling of weightlessness whilst diving at a safe depth. You will experience the thrill of diving and enjoy the many fishes to be seen in the shallow waters around Lanzarote. Are you short on time?, this course might be right for you. 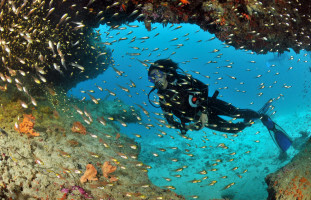 The PADI Scuba Diver course is for people who are short on time but really want to become a diver. 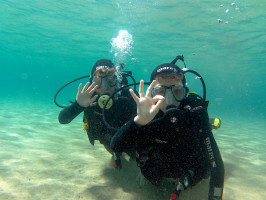 This course is an intermediate step for the Open Water Diver certification. Need to be in good physical health. Don´t need prior experience in scuba diving but they can try it first with the Discover Scuba Diving program. 1st: Knowledge Development (online, independent study or in a classroom) to learn and understand the principles of scuba diving. 2nd: Confined water sections 4 and 5. 3rd: Just two of four dives of the Open Water Diver course. Get started by registering for Open Water Diver Online with PADI’s eLearning. Is a program for Children who are at least 8 years old. They can use scuba gear to breathe underwater and swim around in shallow water. They need aproval from parents. Experience scuba diving under the direct supervision of a PADI Profesional. They breath for first time underwater in water shallower than 2 meters./6 feet. If you’ve always wanted to do scuba diving, this is where it starts.Get your first certification with the PADI Open Water Diver course. To start PADI Open Water Diver course (or Junior Open Water Diver course): Must be 10 years old or older. Need adequate swimming skills need to be in good physical health. Don´t need previous experience with scuba diving. What will you learn in this diving course? Next step: After you get your Open Water Diver Certificate, you can go further enrolling on the adventures in diving program and get the adventures in diving certificate or the Advanced Open Water Diver. Diving certification course in Lanzarote. With three adventure dives you can get the Adventure Diver certification. If you always wanted to try digital underwater photography, learn fish identification or dive on the night, there’s a long list of adventures you can take during this program. It’s a great opportunity to work with your instructor, develop your sccuba diving skills and get more confidence. Go for the activities you like and enjoy underwater more than ever. 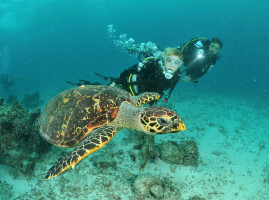 Get credit to get PADI Specialty Diver certificate enrolling on a specialty course. PADI (Junior) Open Water Divers who are at least 10 years old and want to take the next step are allowed to participate in certain Adventure Dives. Check with us what are the best for you. You choose what you are interested in: develop you bouyancy skills, learn name of fishes, learn basic knowledge about underwater photography. Just plan with us your interests. Apart of basic scuba equipment, you will learn to use different gear depending on the adventure Dive you choose. Next Step: Sign up for Advanced Open Water Diver Online and start learning right away. 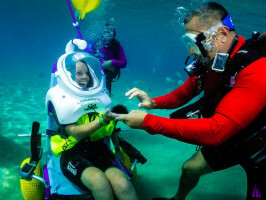 Sea Trek is an innovative system that allows you to walk under the sea. It consists of a helmet that offers us an impressive vision (manufactured with the most advanced technology) and a floating raft with two bottles that continuously supply air through the hose-connected hose. This new experience will make you feel zero gravity like on the moon surrounded by our stunning marine life. If you can walk and breathe you can do Sea Trek! To do this activity the minimum age is eight years, it is not necessary to know how to swim, you can go with glasses, you do not need experience and can do it to anyone regardless of their physical form, since you just need to walk and breathe and a small training of ten minutes. It lasts about 45 minutes and with a maximum depth of six meters. Your makeup won´t run, and you can wear prescription glasses. Pre-determinated path through colorful marine life and schools of beautiful fish. For security is not allowed the use of personal cameras. Sea Trek for people with reduced mobility is a new product that we are developing and improving in Native Diving Lanzarote, Canary Islands. We are very happy with this first time, everything runned very well and our 3 friends enjoyed a lot under the water of Playa del Jablillo in Costa Teguise. From Sub Sea System, Sea Trek headquartes in California, have congratulated us for being the first to dare with this experience.We are prepared to make this good time reach anyone who wants. We do not do pickups with chairs. This activity needs to be prepared in advanced. Snorkel Full Face is the first full-face snorkeling mask allowing you to breathe just as easily and naturally underwater as you would on land. Try it out at our diving centers of Puerto del Carmen and Costa Teguise. A snorkel pack to rent is also avalaible.It comes with glasses, tube, fins and neoprene (suit) that way you couldenjoy in full conditions the practice of snorkeling. Playa del Jablillo in Costa Teguise, Playa Chica in Puerto del Carmen and Playa Flamingo in Playa Blanca. 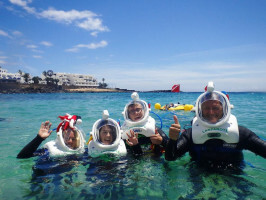 We will teach you the basics of snorkeling and show you the great marine life of Lanzarote. The Atlantic Museum of Lanzarote is located in the bay of Las Coloradas, south of Lanzarote. It is the work of the British artist Jason deCaires Taylor and is the first underwater museum in Europe, there’s two already, one in Mexico and one in the West Indies.In a extension of 2,500 square metres we can find more than 300 figures, some of the models used for the sculptures of the Atlantic Museum are neighboring the island of Lanzarote. If you are interested in this experience, do not hesitate to contact us! Requirements for the Atlantic Museum dives. Minimum qualification open water diver. You have to book 48 hours in advance. 2 dives are made. 1st in the Coloradas and 2nd in the museum. Includes transportation, complete equipment, boat and museum entrance. Glass Bottom Snorkel is the easiest way to snorkel, you will be able to breathe through your mouth and nose without goggles and tube.It is a floating raft with a large lens that will allow you to see the seabed without having to put your head in the water. Also it is for children from 3 years!